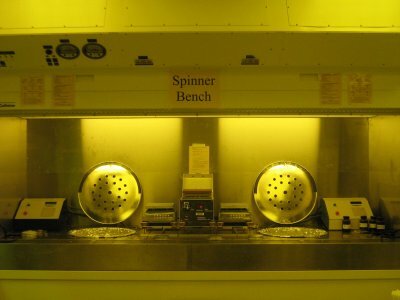 The Spinner bench is a laminar flow hood equipped with two SP100 programmable spinners, two ionized nitrogen guns, and three aluminum programmable hotplates. Two wafer spinning chucks with diameters of 45mm and 85mm are provided. Each spinner has a lid and must be closed during operating. Custom recipes can be created on the Micro-Bit Technology controller. Spin speeds range from 0-7,500 rpm, and spin durations from 0-999.99 sec.